A collection for all bathroom customers who are nature lovers. Axor Massaud responds to the yearning desire for harmony. The mixer body is a product of nature, the flood jet a waterfall and the bath tub a lake. Bathroom planners can use Axor Massaud to create a retreat where their customers can leave behind hectic everyday life and immerse themselves in nature. The single lever basin mixers are available in two heights. You can also use basin mixers in 3-hole or wall versions. The free-standing bath tub is combined with the floor-standing single lever bath mixer, and there are also matching mixers for the bath tub rim and tile edge. 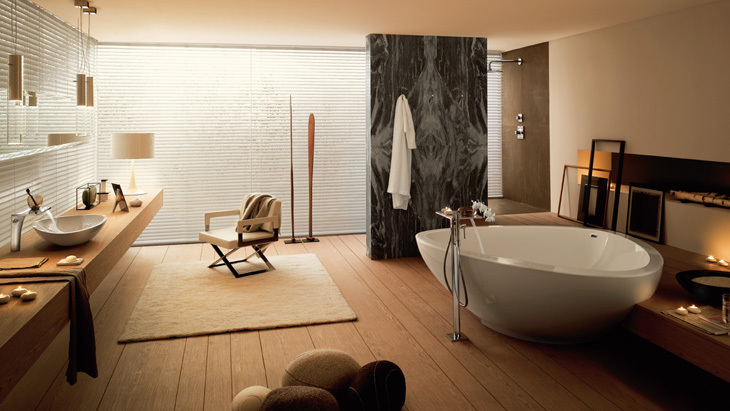 The wide shelves of the wash basin and bath mixers are typical of Axor Massaud. Various concealed installation thermostats and valves are available for the shower, as well as a shower mixer. For the Axor Massaud bathroom there are matching hand, plate overhead and side showers in clear design. Axor Massaud accessories cover almost all areas of bathroom furnishing and complete the natural bathroom concept: from the shelves and containers to the towel holder. Wash bowls and built-in wash basins are made of mineral casting, while the free-standing bath tub is made of a sandwich material with a brilliant white gel coat finish. The shape of the wash basin is ideal for use in combination with Axor Massaud basin mixers. The basins are ideally suited for dealing with the gush spray, minimising splashing as a result. Which wash basin matches Axor Massaud?